It gives me immense pleasure to be amongst you on the occasion of the celebrations of the Centenary of Indian Cinema, being organized jointly by the Government of Tamil Nadu and the South Indian Film Chamber of Commerce (SIFC). The long journey of Indian Cinema began in the year 1913, when the father of Indian Cinema, Dada Saheb Phalke, a devout man from a small town, brought up in a traditional Hindu family, sold his wife’s ornaments and made the first full-length feature film-Raja Harishchandra. Since then, the march of Indian cinema has been so impressive that today our film industry is vibrant and flourishing in different regions and languages. Indian Cinema has now become a global enterprise. Rapidly improving technology has helped the industry upgrade itself as also to radically alter the manner in which it reaches the audience. Indian film making industry is one of the largest in the world and Indian Cinema has found market in a large number of countries. Increasingly our filmmakers are also being recognized in many International Film Festivals. Over the years, the Indian Film Industry has adopted latest technologies. Indian film industry has already taken to the medium of digital cinema. Facilities for film production as well as post production in the country have vastly improved and some are truly of world standard. Several famous international production houses have evinced keen interest in our film industry and many Indian film enterprises are now participating in production and distribution of films around the world. Needless to say, music of Indian Cinema has also been enthralling millions within India and overseas. 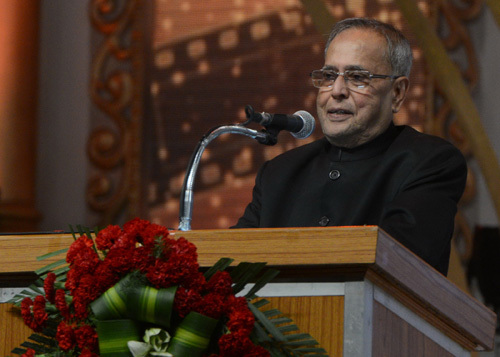 The southern film industry has played a major role in the development of Indian film industry. On this day, we would be failing in our duty if we do not remember the outstanding contribution made by great luminaries of South Indian Cinema like Shri M.G.Ramachandran, Sivaji Ganesan, N.T.Rama Rao, Prem Nazeer, Dr.Raj Kumar, S.S.Vasan, Nagi Reddy, L.V.Prasad and many others. Every year National Film Awards are conferred under different categories on Indian films for their aesthetic and technical excellence. It is heartening to note that a majority of these awards are bagged by films made in South Indian languages. This is clearly indicative of the contribution made by the southern film industry to the overall quality of Indian Cinema. The Government has taken a number of steps to support the film industry, for example, by recognizing the best talent through awards, by showcasing some of the best Indian films in film festivals in India and abroad and also contributing to the nurturing of skilled human resources. In the hundred years of India’s cinematic journey, the method of story telling and distribution technology has undergone changes. With new methods of story telling and different formats of reaching cinema to all corners of India, there is also increasing realization on the need to preserve our cinematic heritage for the benefit of future generations. The Government of India, with active support of the film industry, is engaged in efforts to restore, preserve and digitize our film legacy. The Film & Television Institute of India, Pune and Satyajit Ray Film & Television Institute, Kolkata are two of our premier institutions that impart education in the field of film and television. They have given to the film industry some of its best talent. A number of acclaimed members of the Indian film industry are from these Institutes. The time has perhaps now come to take necessary steps to strengthen them and make them institutions of "national importance”. Cinema is a popular and powerful medium of communication. The number of cine goers in country is very large. It is therefore essential to strike a balance between entertainment and social responsibility of this medium. The recent incidents of crime against women and children have shaken the conscience of the nation. We have also been witness to tragic communal riots in some parts of our country recently. We must find ways to reverse the erosion of our values. In this context, I would like to stress upon the crucial role the Cinema can and must play in resetting the moral compass of the nation. It is the responsibility of everyone associated with the film industry to use the powerful medium of cinema to portray our positive societal values for building a tolerant and harmonious India. I call upon the entertainment industry to be mindful and sensitive to this responsibility and take all steps to create cinema that contributes to social transformation and moral upliftment. With these words, I express gratitude to the organizers for giving me this opportunity to be amongst you on this special occasion.